I was delighted to attend the property seminar, which was hosted by Finton Doyle. It is clear that they are specialists in this field, and I would have no hesitation in recommending Finton Doyle and their associates in my future dealings. The guest speaker was very informative and the meeting was friendly and open, which gave me the chance to ask questions to help aid my decision making going forward. Since moving to Finton Doyle two years ago, we have never looked back and regularly recommend their services. A pro-active team, they are a joy to work with; approachable, knowledgeable and professional. I have always found Finton Doyle to be a friendly, effective, competent and professional accountancy company who are always on hand to help with any advice that we have needed. They give us the reassurance to know that we are complying with the rules and regulations and if we have any queries, Chris and the team have always got back to us. I have no hesitation whatsoever in highly recommending them. 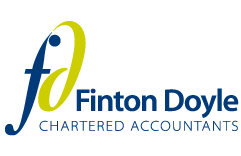 I have been using the accounting services offered by Finton Doyle for last 4 years now and have always found them to be very professional and approachable. From the start I have been with Chris who guided us in setting up the company and advised us on all kind of issues that a start-up has to deal with. It was his advise that helped us take some key decisions early on which in turn helped us manage the money better. The support from Finton Doyle staff to run pay-roll and the timely advise on all things finance has been absolutely fantastic. I have in past used big names and comparing to them, I find service and support from Finton Doyle much more reliable and considerate. With Finton Doyle I don’t feel like a number but a respected customer whose business means a lot to them and for whom they are willing to go the extra mile. Their services are very reasonably priced and Chris in particular with his tremendous help and timely advice has earned my respect and trust. I would and do recommend Finton Doyle without any hesitation. All the team at Finton Doyle are really pro-active and take care of my business requirements. Their communication and attention to detail provides the extra security the small business needs. The newsletters and information on legislation changes is swift and tailored to our needs, I’m very pleased with their performance and would not hesitate to recommend them to any of my business contacts. Having attended today’s seminar “There’s more to property than bricks and mortar”, I would like to thank Finton Doyle for offering useful and practical advice for budding property investors and an informative re-fresh for those currently investing in property portfolios. It is welcoming to know tax and accounting advice is at hand with the services Finton Doyle has to offer. Representing Dewhurst Homes Estate and Letting Agents, we would highly recommend Finton Doyle’s accountancy services to any of our current and potential landlords stepping into the Buy To Let market. Thanks for all your assistance setting up the company and getting it through key milestones, especially noting your knowledge of current company legislation. Mathew and his team have been a great support to Cameron TCMS as we started up our new venture. His pragmatic and creative approach to financial management have helped us make some good decisions over the last year and I’m looking forward to continuing to work with Finton Doyle as we continue to grow. Mathew and his team are very professional who operate with a personal touch. They are always very efficient and provide us a with a very good quality service. We are in Cornwall they are in Preston their communication is spot on. Finton Doyle have been working on my accounts for the last 12 months, we moved from our previous accountancy firm because we couldn’t get the advice we needed when we needed it. Finton Doyle respond quickly with the right advice so that we can respond to the market. Very pleased with their service, highly recommended. Mathew provides high quality and cost effective services, he is very easy to work with and goes the extra mile for great customer service. I can wholeheartedly recommend him and his company to any business owner requiring pro-active accountancy and business support. Natasha Schofield, Managing Director of Grassroots HR Ltd & Grassroots HR Franchising Ltd. It sometimes feels like Mathew is more of a business partner than an accountant. Definitely somebody to turn to when it’s time to move your business forward, he and his staff have given me some of the best general advice (not just financial), over the last 3 years. Mathew has been our accountant for many years, firstly with Howard & Co and now with his own company Finton Doyle. He is thorough,very knowledgeable and efficient. Thank you once again for a very enjoyable and informative presentation yesterday. I learned a lot of new things about how PAYE works and gained a much better understanding of others. I have attended the PAYE workshops run by HMRC, but found that your presentation yesterday was much easier to follow as it provided just enough information in bite size chunks, making it much easier to absorb information. We aren’t like other accountants. Get in touch to see for yourself. Great informative seminar regarding the changes in submitting VAT in the UK. Although there are not a lot of answers yet from HMRC about how everything is going to work, it was great to be forewarned of what is coming our way and I learnt a lot about alternatives to Sage accounting and currently now looking at how we switch to Xero for our accounts package. Finton Doyle seminars well worth attending. Always an informative, welcoming, relaxed meeting. Simple, non-jargon delivery with a host of practical advice. Highly recommend taking the time to attend.